This eye catching, honey colored Pumpkin Cranberry Bread has a moist and dense, cake-like texture and is flavored with pumpkin puree, its accompanying spices, and fresh cranberries. The fresh cranberries add color and a nice tart flavor to this bread. If fresh cranberries are not available, you could use frozen or even dried cranberries. While delicious plain, I couldn't resist topping this bread with a tangy cream cheese frosting. The pumpkin has a long history in North America. The early colonists used it in both sweet and savory dishes, making stews, breads, porridges, puddings and pies. Fall is its harvest time which is when we use it most in our baking. I think that it is because its sweet, mild, earthy flavor seems more suited to the Fall/Winter months than in the heat of Summer. Of course, there is no denying that the most popular pumpkin dessert is the pumpkin pie. Thanksgiving would not be complete without it. However, the pumpkin's flavor and smooth texture are also excellent in quick breads. Scones, muffins, and loaves are transformed when pumpkin puree, along with ground cinnamon, ginger, and cloves are added. These breads take on a muted orange color and their texture is wonderfully dense and moist. This Pumpkin Cranberry Bread recipe calls for canned pure pumpkin (do not buy the canned pumpkin that has the spices already added) but you can also make your own pumpkin puree. Just use the smaller pumpkin varieties like Sugar Pie, Baby Bear or Cheese Pumpkin (approximately 5-7 lbs., 2 1/2 - 3 1/2 kg.). Cut the pumpkin in half lengthwise, remove all the seeds and stringy fibers, and place cut-side down on a greased baking sheet. Bake at 350 degrees F (177 degrees C) for approximately 45 minutes to 1 1/4 hours (depending on size) or until easily pierced with a knife. Scoop out the pulp and puree in a food processor until smooth. Then strain the puree through a piece of cheesecloth suspended over a strainer to extract all the liquid. Cool before using. Pumpkin Cranberry Bread: Preheat your oven to 350 degrees F (180 degrees C) and place your oven rack in the center of the oven. Butter, or spray with a non stick vegetable spray, one - 9 x 5 x 3 inch (23 x 13 x 8 cm) loaf pan. In a large bowl, sift or whisk together the flour, baking powder, baking soda, salt, ground cinnamon, ginger, and cloves. In the bowl of your electric stand mixer, fitted with the paddle attachment (or with a hand mixer), beat the butter and sugar until light and fluffy (2-3 minutes). Add the eggs, one at a time, beating well after each addition. Scrape down the sides and bottom of your bowl as needed. Beat in the vanilla extract and pumpkin puree. With the mixer on low speed, add the flour mixture and cranberries and beat just until incorporated. Pour the batter into the prepared pan, smoothing the top with the back of a spoon or with an offset spatula. Bake for about 55 - 65 minutes, or until a toothpick inserted into the center of the loaf comes out clean. Remove from oven and place on a wire rack to cool for about 10 minutes before removing the bread from the pan. Let cool completely before frosting. Cream Cheese Frosting: In the bowl of your electric stand mixer, fitted with the paddle attachment (or with a hand mixer), beat the cream cheese until smooth and creamy. Add the butter and beat until incorporated and smooth. Add the vanilla extract and confectioners sugar and beat until fluffy (2-3 minutes). 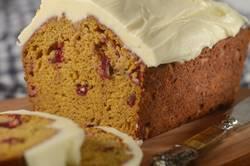 Spread the frosting on the top of the Pumpkin Cranberry Bread. Store leftovers in the refrigerator for up to five days. Or this bread can be frozen.